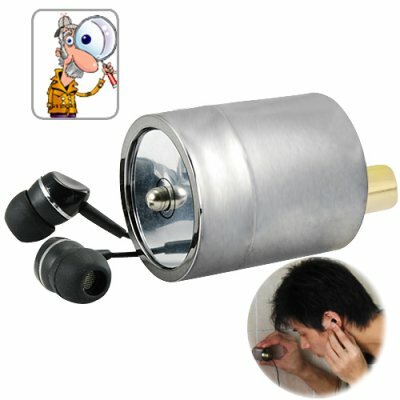 Successfully Added Inspector Gadget Audio Listening Device to your Shopping Cart. As simple and powerful as possible from a handheld listening device, this audio gadget can let you hear conversations through walls and other barriers. So how does it work? Simple, you switch on the Inspector Gadget Audio Listening Device, insert the earphones, and then place the audio bug on the wall and listen to what's being said. This audio gadget works by amplifying the vibrations of audio. When people are talking in a room their voices are simply a waveband, and depending on how loud they are talking, the waveband travels short and long distances which are picked up and amplified by this device. The sensor on this audio gadget senses the vibrations hitting the walls, ceiling and floor and amplifies them so that you can listen to whats being said. If the waveband is low, meaning people talking in a lower note, then you can use the dial located at the back of this cool audio gadget to adjust the volume and increase the sensors amplification. It really makes "ing" more fun and productive. Lets face it, no one really tells the truth straight to your face. So why not find out the truth, you will be amazed what people might say when your not around. ;-). So, whether you are in a motel room, hotel room, your apartment or just in the next room the CVKA-G109 will let know whats being said. The CVKA-G109 is a highly sensitive audio gadget and should be used with care. This audio listening device is available right now at a factory direct from the leader wholesale priced electronics, Chinavasion. What is the distance permitted by the audio bug to listen to voices? The distance depends on the thickness of the wall, the CVKA-G109 works best when used on barriers that are 6 - 10 inches in thickness. It will also work well with distances of 10+ meters, depending on the volume of sounds on the other end of the wall. Can I record what I record what I'm listening to? The CVKA-G109 comes with a 3.5mm earphone out put jack, although the CVKA-G109 does not come with a recording devices, you night be able to connect a voice recorder using the earphone jack output, record on to a voice recorder if the voice recorder or other recording device has a audio line in.